The 2-1/4-horsepower, 12 amp motor allows the router to cut through the toughest hardwoods. The router's electronic variable-speed trigger lets you select from between 8,000 and 24,000 rpm for specific applications. And because this system employs full electronic feedback, you can trust the router to provide constant speed under load. In addition, the motor's soft start reduces start-up torque for optimum control. The router's fixed base features a micro-fine depth-adjustment ring that provides precise bit adjustments in 1/64-inch increments. Because the ring--not the motor--turns to adjust bit depth, a constant switch/cordset location is maintained when you are using the router in a table. This minimizes difficulty in turning the unit on and off and keeps operation consistent. The plunge base features an adjustable five-position turret stop for use when making repeated plunge cuts. The easy-to-reach plunge-release lever and switch keep control at your fingertips during routing. The clear, LEXAN sub-base offers optimum bit visibility and base durability, and it accepts standard template-guide bushings to make application-specific setups easy. Also, a sub-base concentricity gauge is included. If you insert this into the collet prior to bit installation, it will help you center the sub-base relative to bit location when making your cut line off of the side of the base. Moreover, the sub-base and other included bases are designed to make both base and bit changes easy. Quick-release motor latches allow for fast and easy motor-pack removal, while a spindle-lock button allows for single-wrench bit changes. The fixed base also offers a flat top, so the router can be set upside down for easy bit and depth changes. Additionally, long, self-releasing, eight-slotted collets provide improved bit retention and prevent bits from jamming. Each base features comfortable rubber over-molded handles and a low center of gravity for improved balance and control and reduced user fatigue. The base also has a patented through-the-column dust-collection system. This allows a vacuum to be attached to the router without blocking your line of sight. 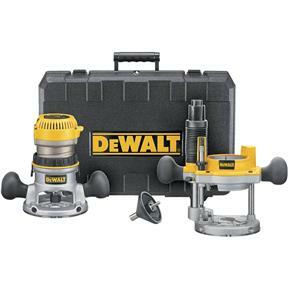 The DW618PK DEWALT 2-1/4-Inch EVS Fixed Base/ Plunge Base Router Combo Kit with Soft Start is backed by a three-year limited warranty. Includes: motor pack, fixed base, plunge base, 1/2" and 1/4" collets, wrench, sub-base concentricity gauge, large hole sub-base, vacuum adaptor, and heavy-duty kit box.